Wendy joined Mohawk Ambulance Service in October 1987 as a part-time in-house collections agent. She’s proved invaluable to the company from day one, and she developed not only Mohawk’s first in-house collections department but also the company’s first front-end verification department. Wendy’s exceptional leadership skills led to her promotion to Business Office Manager in 2004. Four years later, she was appointed as Compliance Officer for Mohawk, and she has provided outstanding guidance and attention to this important role for the company. Ambulance providers in New York State and across the country value Wendy as a resource, getting to know her through her involvement in both the state and national ambulance associations. Wendy has held leadership roles in the American Ambulance Association (AAA) and the United New York Ambulance Network (UNYAN). She was the chairwoman of the AAA Medicare Regulatory Work Group and continues to be an active member of this group. In addition, she has been the Reimbursement Chairwoman for UNYAN since 2010. 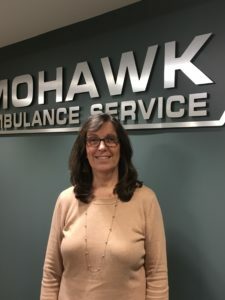 Each and every day of Wendy’s 30 years of service with Mohawk she demonstrates her dedication to improve ambulance services, and she is a valuable member of the Mohawk Ambulance management team. When she’s not working, Wendy enjoys spending time with her three daughters and her husband of 38 years, and she is anxiously awaiting the arrival of her first grandchild.